This is a complete rip-off of something I had at The Wren in New York. You can order a glass of wine and one of their “jars” (preserves and such). And their roasted tomatoes, which they noted were served with Salvatore ricotta (don’t get me started) were too tempting to pass up. I still don’t even care what’s in the other jars, I know I made the right choice. These slightly chewy, still slightly tart tomatoes have a place on pasta or maybe beside eggs but I highly recommend them exactly as pictured here which is exactly as I had them at the restaurant too. 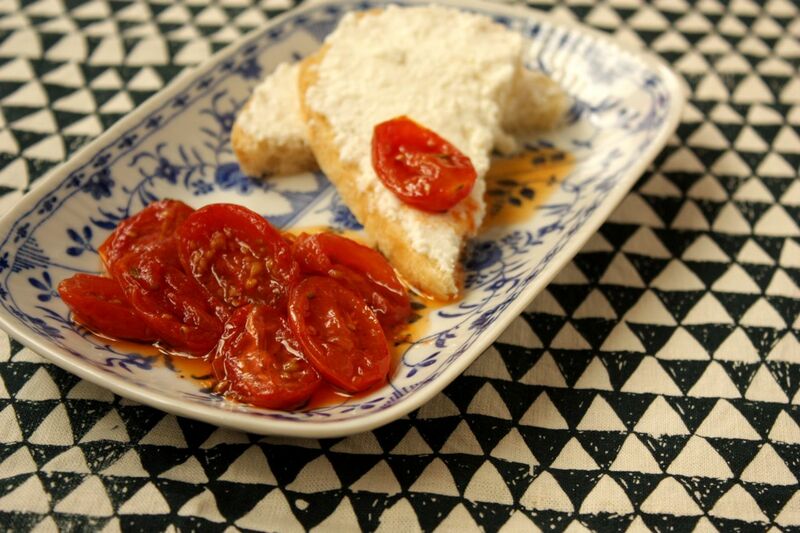 Serve a generous amount of tomatoes right in the poaching oil, beside crisp toast points topped with an even layer of softened and seasoned ricotta. For me, this isn’t a “starter” or an app, this whole thing is main-event-territory. In a casserole dish or other high-sided, ovenproof pan, add the tomatoes, garlic, thyme and sugar, season well with salt and pepper and then pour the oil to at least halfway up the side of the tomatoes. Mix well and spread evenly so the tomatoes lie in a single layer. Bake for 45 minutes then remove to stir well. Taste and adjust seasoning, then mix and spread the tomatoes into an even layer again and return to oven to bake for 90 minutes more. Serve warm or at room temperature, ideally beside toast points smeared with fresh ricotta.